It’s still November, but Mid-Southerners have already experienced the first snow event of the winter season! Thanks to a strong upper-level low pressure center which developed and moved through the region Monday night, the right combination of significant moisture and cold temperatures were able to make a rare early appearance. As a result, rain in the Mid-South began to change to snow and for some in the area it was enough for a decent accumulation! In general, it was the first measurable November snowfall in the region in two decades! 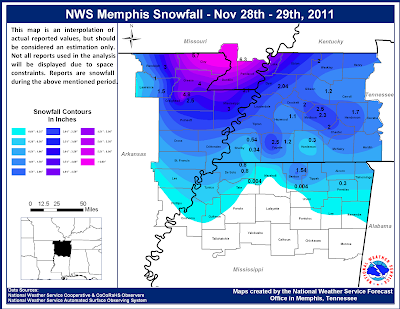 As is typical in Mid-South winter weather events, location made a great difference in just how much snowfall occurred. The strongest dynamics of the system, where the heaviest precipitation was able to develop, set up over a rather localized area and ended up largely north of the Memphis metro area. Complicating matters further, temperatures during the event were borderline, with readings generally remaining just above freezing, between 33 and 35 degrees. Additionally, ground temperatures remained well above freezing (in the 40s) due to the very warm temperatures preceding the system – it was 73 degrees in Memphis on Saturday! These factors served to limit snow accumulation potential greatly, but in areas where snow was able to fall hard enough, these limitations were overcome, allowing for accumulations in grassy areas and elevated and non-paved surfaces. Fortunately, roadways across the region remained just wet for the most part, resulting in few significant travel problems. Across the city of Memphis, snow amounts were minor, a half inch or less. Memphis International Airport recorded just one-tenth of an inch of snowfall, with 0.3” recorded at the National Weather Service office at the Agricenter in East Memphis. Slightly higher amounts, up to 1”, occurred across northern Shelby County, with 0.6” recorded at MWN headquarters in Bartlett. Other areas of the metro, however, saw more significant snow accumulations. In Tipton and Fayette Counties, 1 to 2” of snowfall was a common occurrence, with localized higher amounts up to 2.5” in Fayette County. Amounts up to 1” also occurred across Crittenden, DeSoto and Tunica Counties. The most significant snowfall of this event though was north of the metro area. Several places in northwest Tennessee, the Missouri Bootheel, and especially northeast Arkansas saw snow accumulations of 2-4 inches as heavier snow bands redeveloped and persisted in these areas overnight Monday into early Tuesday morning. There were even isolated reports of up to 6”+ of snow accumulation, nearly hard to fathom for November in the Mid-South! See the map below for a more complete depiction of snow amounts across the entire region. Map of snow accumulations reported across the region from Monday night – Tuesday morning. The heaviest amounts were to the north of the metro area. Map from the National Weather Service. Once snow tapered off by Tuesday morning, whatever snow was left on the ground generally melted away very fast as temperatures recovered to near 40 degrees. However, to our north where the most significant snow occurred (and thus took longer to completely melt), visible satellite imagery was able to detect remnants of snow cover as late as Wednesday morning (see image below). Some of the most visible (and thus deepest) snow that remained was along the higher terrain of Crowley’s Ridge. 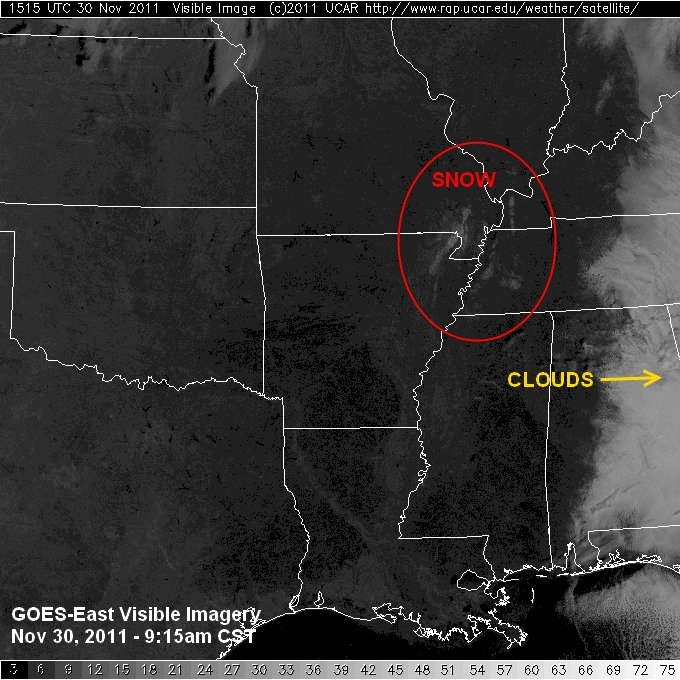 Remnant snow cover across northern portions of the Mid-South as detected by the GOES-East visible satellite on Wednesday morning. 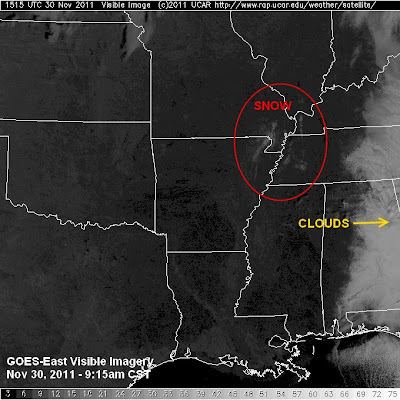 Cloud cover is noted to the east across Middle TN into Alabama. It’s impossible to say whether this early start to the winter weather season in the Mid-South is a sign of things to come, but whatever lies ahead, you can count on MemphisWeather.Net to keep you accurately informed and up-to-date!